Photo: IGY’s Yacht Haven Grande hosts the 2018 USVI Charter Yacht Show. Credit: Phil Blake. St. Thomas, U.S. Virgin Islands. 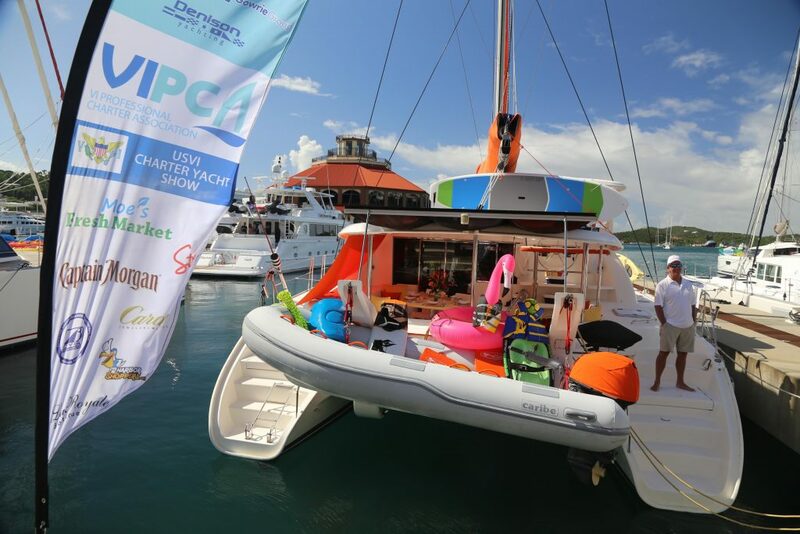 Nearly 60 multihulls, monohulls and motor yachts lined the docks at IGY’s Yacht Haven Grande on St. Thomas for the USVI Charter Yacht Show, held November 10 to 13, and hosted by the VI Professional Charter Association (VIPCA). Over 100 brokers from the Caribbean, U.S. and Europe toured the fleet, which ranged from 45- to 111-foot in length. The 2018 show was the largest in well over two decades in terms of the number of yachts showing, brokers in attendance and yacht size combined. This striking fact certainly shows that the U.S. territory’s charter industry is booming. It’s a theme played out on several fronts such as the boutique nature of the industry, virgin cruising grounds and the territory’s public and private sector investments in assuring the success of the marine tourism industry. Photo: Nearly 60 magnificent crewed charter yachts on show at the 2018 USVI Charter Yacht Show, held at IGY’s Yacht Haven Grande. Credit: Phil Blake. On another tack, captain only charters are the niche aboard the Lagoon 44, Altitude Adjustment, with retired California police Sargent, Brian Saupe at the helm and in the kitchen.“I cater to middle incomers by charting at bareboat or captain only rates, yet I do everything: drive the boat, cook and bartend,” says Saupe, a life-long sailor who since childhood dreamed of living and working on a yacht. 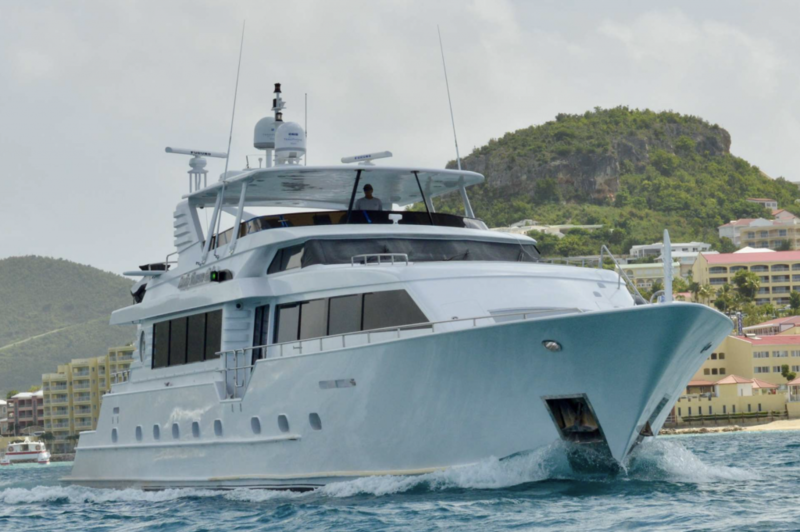 Now in his fourth charter season, Saupe purchased his current vessel in the aftermath of Hurricane Irma and subsequently completed 20 weeks of charter from January to June this year. Multihulls dominated the USVI Charter Yacht Show fleet. However, the opportunity to charter a monohull was represented by Ocean Star, a Beneteau Oceanis 60 chartered by Hugh O’Brien and Ellen Davern. “Our guests are sailors. They enjoy heeling over and going fast. 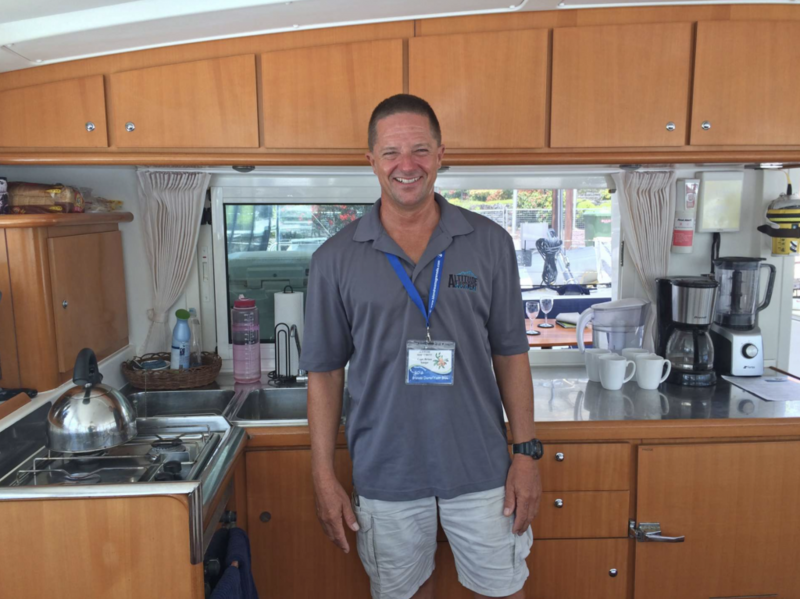 Let’s just say we can make it up to Anegada for lunch while the cats won’t arrive there until dinner,” says O’Brien, a former yacht racer who underscores Ocean Star isn’t without its luxuries such as an ice maker, surround sound system and multiple paddle-boards. The Lady Sharon Gale, a 112-foot Broward that underwent a $1.5 million refit in the last year, was the largest motor yacht on display. 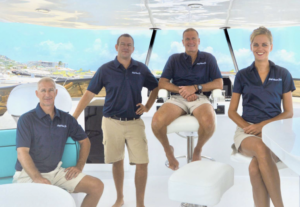 “We’re a bit of a dinosaur as a monohull as a large percent of the charter fleet today is catamarans, but I think the world need’s dinosaurs,” says Keith Hyatt, captain of the Lady Sharon Gale, which is based in St. Maarten. They plan to relocate to Grenada for the next hurricane season, and spend much of this winter season chartering in the Virgin Islands. 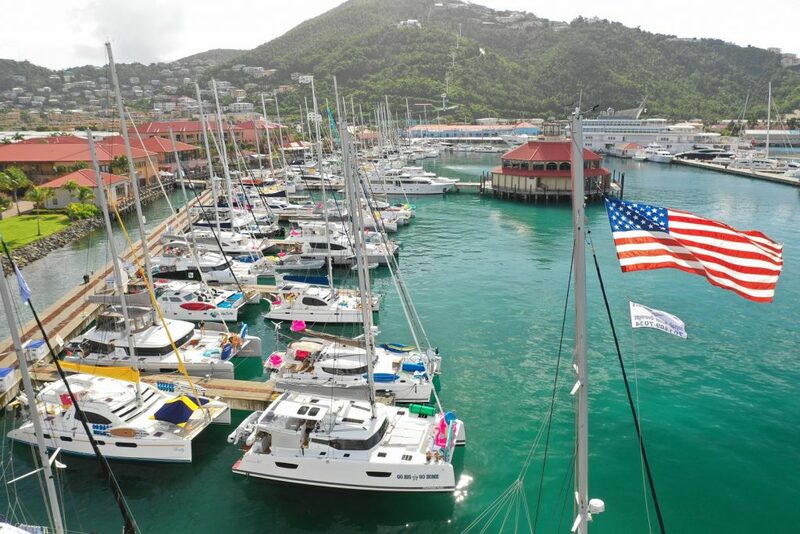 The USVI offers advantages to charter crews and clients alike that aren’t found in other destinations.“It’s easy to fly into St. Thomas, plus there are many places to provision, obtain parts and complete repairs,” saysShangri La’s Drescher. This full-service destination is one reason Jon and Kaitlyn Bellemare have based their 83-foot Prout catamaran,Blue Gryphon, in the USVI, specifically at Yacht Haven Grande this season. The couple and crew cast off from the yard in Belfast, Maine, at the end of October to sail south specifically to be part of the USVI Charter Yacht Show. Anchorages in the USVI are truly virgin. The Spanish Virgin Islands (SVI), including Culebra and Vieques, are located a little over 20 miles to the west of St. Thomas. “Unspoiled, uncrowded, natural. 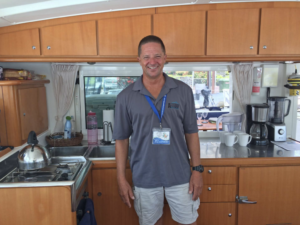 These are good ways to describe the anchorages and beautiful beaches on Puerto Rico’s offshore islands,” saysLady Sharon Gale’s Captain Keith Hyatt. Public and private sector partnerships are fueling investments in the USVI’s infrastructure that will bolster the marine tourism industry. For one, the Virgin Islands Economic Development Authority is working with VIPCA on over half a million dollar proposal for 100 new transient moorings and restoration of another 100 day charter moorings territory-wide. The first 35 of these moorings will be available in 2019. Secondly, is an improvement in customs facilities, Third, VIPCA’s Marine Apprentice ‘on the water’ scholarship program through theCommunity Foundation of the Virgin Islands’ (CFVI) Marine Rebuild Fund aims to bring more VI captains in the industry. The My Brother’s Workshop (MBW)-Marine ‘on shore’ program educates VI youth about careers in marine maintenance, repair and fiber glassing. The USVI Charter Yacht Show is now one of the biggest in the Caribbean. One reason is that the territory currently has some of the strongest infrastructure in the region for charter yachts. Contact Select Yachts for professional services in the charter industry. We provide honest, trusted advice and assistance to manage your charter yacht or book your dream vacation.